The one book Digby took with her to read while in Mexico was “Malinche’s Conquest” by the Australian writer Ann Lanyon. 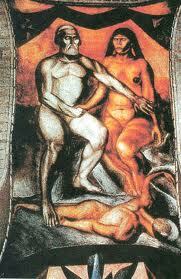 She became immersed in and intrigued by the story of La Malinche. The story helped her understand the history, the geography,the feel of the Spanish invasion of Mexico, and of this strong, resilient woman whose name is still synonymous with “traitor”. She was a translator for Herman Cortes and infamous for speaking the words that caused the fall of the Aztec empire in 1521. La Malinche was a Nahua woman from the Mexican Gulf born in 1500, sold into slavery at the age of 10 and given to Cortez when she was 19. Cortes was the Spanish Conquistador who led the expedition to conquer Mexico for Spain. 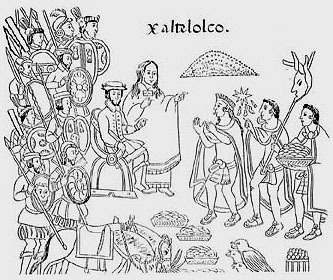 He needed a translator, Malinche had a gift for languages including Nahuatl- the language of the Aztecs – this made her indispensible to him. In 1521 she had a son with him but in 1524 he married her off to another conquistador. Her son Martin, was a mixed race child , a mestizo. Cortes took the child and gave him to a cousin to raise before he left for Spain taking their son with him. La Malinche did not see the child again. She died in 1529. 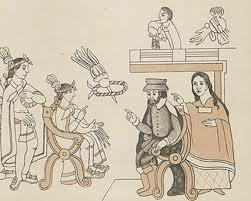 Debate goes on about La Malinche’s role in the conquest and her influence on Cortes at the time. Publically accessible images of La Malinche are hard to find. 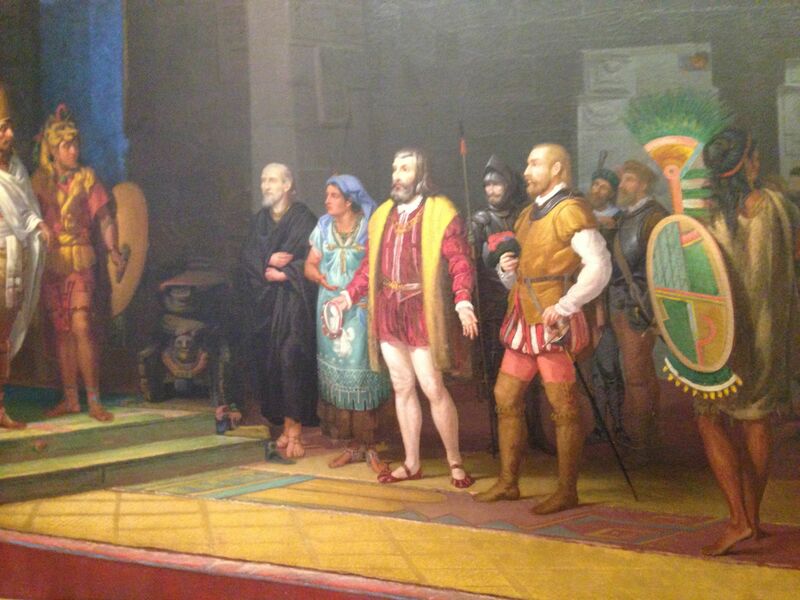 Digby found this painting by Juan Ortega ‘The Visit of Cortes and Moctezuma’ (1885) in Mexico City. Today, in Mexico a derogatory name to call someone is a ‘malinchista ‘ a person who turns their back on their own culture. Interestingly enough, some do not consider Malinche a traitor. Some view her as a heroine, helping spread the word of Christianity. For others, she was a woman in love, who had no choice but to follow her heart and protect her beloved Cortes. Maybe for her it was just a matter of survival, an interesting job, an attraction to the power. However she is viewed with honor by those who consider her one of the first mothers of the Mestizo race because of her son Martin. Regardless of how one perceives Malinche, she contributed to forever change the course of Mexico’s destiny.